Learn to Code by Programming Robots in Minecraft! You've mined for diamonds, crafted dozens of tools, and built all sorts of structures—but what if you could program robots to do all of that for you in a fraction of the time? 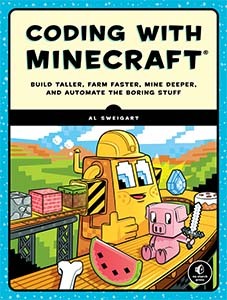 Coding with Minecraft is available under a Creative Commons license, and is free to read online. Download the files for the book. Please post an honest review. You will receive a print book no matter what your rating is. The only requirements are that the review be a minimum of 100 words, you must live within the United States (due to shipping costs), that you must have purchased $50 of products off Amazon (to be eligible to post Amazon reviews), and that you email me first before writing the review.